Virginia Heffernan of NYTimes Magazine blog, The Medium, provides the following interesting take on XO. The much-anticipated XO laptop is an upbeat little instrument, the size of a Bible with a handle. It’s green, the universal color of contemporary virtue. It’s dandy. Heffernan’s Bible comparison was no accident. She relates Nicholas Negroponte’s OLPC program to a mission: that of delivering education to the world’s 2 billion underserved children. In my apartment, the sight of an electronic device that was built to last was almost jarring. My trembling, delicate, temperamental laptop suddenly seemed like a dying tropical bird, while the XO is a happy, healthy puppy. A tough puppy. The XO is said to withstand desert heat, direct sunlight, thick humidity, distressing falls, dirt, rainstorms and (I’m not kidding) assault by cats. Kate and I invited some preschool-age kids, including hers and mine, to come beat it up. They squealed and crowded in cinematically to glimpse the holy thing. 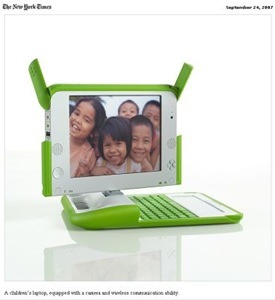 Looked and thought about the XO and OLPC quite thoroughly over the past months, as the linklist above reveals, but the fervent missionary aspect, and its realization in plastic and metal Heffernan sees, had not occurred to me. As one for whom religious missions have no part of his own background, I find it a bit disconcerting. This entry was posted on Sunday, January 27th, 2008 at 3:19 pm and is filed under Education, musings, Technology. You can follow any responses to this entry through the RSS 2.0 feed. You can leave a response, or trackback from your own site.